Fiber preparation determines the texture of the yarn and the ease of spinning. Flickers, hand cards, combs, and carding machines are types of equipment that help you to process fiber in a variety of ways. Processing tools help make fibers easier to spin by separating them and opening them up. The tool that you use depends on the type of fiber you are going to spin and the type of yarn you want to make. Or you may choose to not process at all; many types of fleece can be spun without being processed. A flicker helps process long, silky fleeces of 3 inches or more. Flicking opens up the fiber without losing the fiber’s natural structure. It also removes any weak or damaged fiber and most chaff and dirt. You can flick out fiber that is still “in the grease” (not washed), but it is usually better to wash the fiber gently first so the fibers are easier to separate. Place the flicked locks with the tips going the same way. (A tip is the end of the lock that is toward the outside of the fleece; the cut end is the end cut during shearing.) After flicking, the fiber is ready to spin. Locks are usually spun from the tip end. 1Hold the lock of wool in your lap with your left hand. The tip end of the wool should face out. 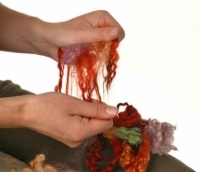 The simplest fiber preparation is to gently pull the fiber apart with your fingers. This is called teasing. When you are finished, the fiber should look like a big fluffy cloud. Teasing is often used to prepare fibers for further processing. 2Hold the flicker in your right hand and brush the tip out. A flicker is a brush made especially for spinners, and you can purchase it where spinning supplies are sold. 3Turn the lock around and brush the cut end. After flicking, the fiber is ready to spin. Locks are usually spun from the tip end. 4Stack in a bundle, keeping the locks facing in the same direction. 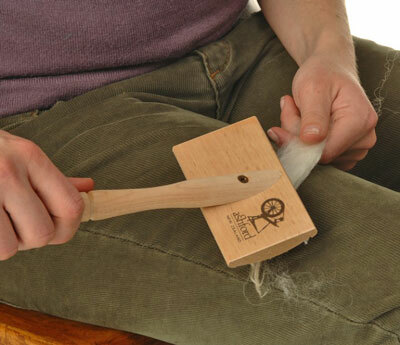 Combing or flicking can be done when the fiber is still damp from washing. When fiber is damp, it swells and straightens, making it easier to comb. Combing or flicking when the fiber is a bit wet also prevents problems with static. If your fiber is dry, use a spray bottle filled with water and a few drops of mineral oil to dampen the fiber.